This highly original collection of essays, written by some of the world's best-known political scientists elucidates state-of-the-art methodological approaches to comparative politics. Giovanni Sartori and Mattei Dogan examine the applicability and validity of statistical techniques in the field. Seymour Martin Lipset considers the effectiveness of binary comparisons while John D. Martz addresses similar questions in regard of multi-state comparisons in Latin America. John Forrest offers an `asynchronic comparison' of weak contemporary African States and similar in Medieval Europe. Ali Kazancigil looks at Turkey's `high stateness' as deviant, and Mattei Dogan concludes the volume with a consideration of the applicability of Weber's typology of legitimacy. Mattei Dogan is Scientific Director at the National Centre of Scientific Research, Paris, and Professor of Political Science at the University of California, Los Angeles. Ali Kazancigil is Director of the Division for the International Development of Social and Human Sciences, UNESCO, Paris, and Editor of International Social Science Journal. Introdution: Strategies in Comparative Research (Mattei Dogan, French National Centre of Scientific Research, Paris, and Ali Kazancigil, Division for the International Development of Social Sciences, UNESCO, Paris). 1. Compare Why and How: Comparing, Miscomparing and the Comparative Method: Giovanni Sartori, Columbia University, New York. 2. Use and Misuse of Statistics in Comparative Research: Limits to Quantification in Comparative Politics: The Gap between Substance and Method: Mattei Dogan, French National Centre of Scientific Research, Paris. 3. Conceptual Homogenization of a Heterogeneous Field: Presidentialism in Comparative Perspective: Fred W. Riggs, University of Hawaii. 4. Binary Comparisons: American Exceptionalism - Japanese Uniqueness: Seymour Martin Lipset, George Mason University, Fairfax, Virginia. 5. The Deviant Case in Comparative Analysis: High Stateness in a Muslim Society: The Case of Turkey: Ali Kazancigil, Division for the International Development of Social and Human Sciences, UNESCO, Paris. 6. 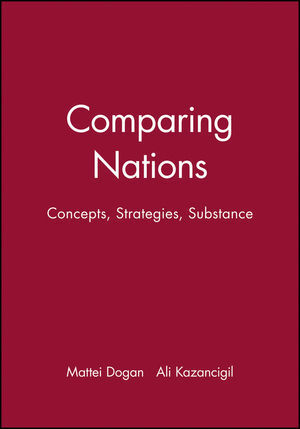 Comparing Similiar Countries: Problems of Conceptualization and Comparability in Latin America: John D. Martz, Pennsylvania State University. 7. Asynchronic Comparisons: Weak States in Post-Colonial Africa and Medieval Europe: Joshua B. Forrest, University of Vermont. 8. The Pendulum Between Theory and Substance: Testing the Concepts of Legitimacy and Trust: Mattei Dogan, French National Centre of Scientific Research, Paris. * Highly distinguished contributors - all at the forefront of the comparative politics field. * An important contribution to the study of comparative politics, each contribution combining empirical evidence within a coherent theoretical framework.